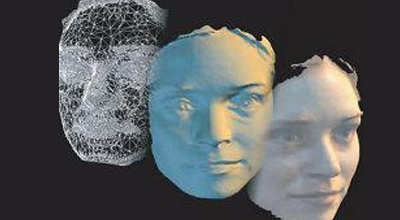 Visitors to London's Science Museum are being invited to have their faces scanned in 3D. The Me in 3D stand at the museum uses a series of cameras to build a virtual image visitors can then view and manipulate. Data from participants will be used by Great Ormond Street Hospital, University College Hospital and Eastman Dental Hospital and Institute to provide better treatment and surgery for patients with disfigurements and congenital conditions. "It's a very simple process using simultaneous photography by nine cameras and then some software modification to produce a 3D image," says Dr Chris Abela, a senior craniofacial fellow at Great Ormond Street Hospital. "Any visitor to the stand will be able to spin their image around, look at themselves from behind their ear or from the worm's eye view as we call it and really see themselves in another dimension." Visitors, who must first sign a consent form so that their data can be used for research, will also have the option of rendering their 3D faces in zebra and crocodile skin, just for fun. The more faces scanned, the better we will understand the human face in all its great variety, the researchers say, and that could mean better facial surgery for children born with disfiguring disorders or for patients requiring reconstructive surgery. "We know a lot about the bones in our faces but little is known about what makes our face the shape it is and about the skin and muscles that make up our face," says Dr Abela. "By collecting as many 3D face photographs as we can we will have a greater understanding of our complex faces, and have greater knowledge to plan and perform the best facial surgery in the future." Allan Ponniah, the Great Ormond Street surgeon who conceived the project, says: "This will be the largest database internationally of face shapes collected to date. London is the perfect place to capture the wide diversity in facial features of the global population." "We are entering a new paradigm where we would like to plan surgery based on tailor-made solutions for individual face shapes as opposed to using a one-shape-fits-all average template." The data could be used to devise better treatments for children with conditions such as Apert, Pfeiffer, or Crouzon syndromes, which result in deformation of the skull. The new project follows another based at the museum which involved getting visitors to take part in real scientific research. The Familiar Faces study, involving scientists from the University of East London, consisted of a series of simple tests to assess the facial recognition abilities of members of the public. The tests were designed to spot what are called "super recognisers", individuals who can recognise the face of a person they have barely looked at, and those who might be suffering from a rare condition called prosopagnosia, or face-blindness. This leaves an individual with little to no ability to recognise faces - even immediate family members. For the Science Museum, both projects offer a chance to get visitors to the museum involved directly in science. "We see this as part of our work as a museum not only to have visitors looking at exhibits but to actually be part of real scientific research," says Priya Umachandran of the Science Museum. "It's another great way of engaging the public with science." Me in 3D runs at the Science Museum until 10 April.